Masonic Brethren, members of the Geary family, representatives of the Fire Service and RSA parade toward the Otago Peninsula Museum to honour Otago Peninsula resident John Geary, who died at Chunuk Bair, Gallipoli on 8 August 1915, during World War 1. Photograph: © Peter McIntosh. L.Cpl. 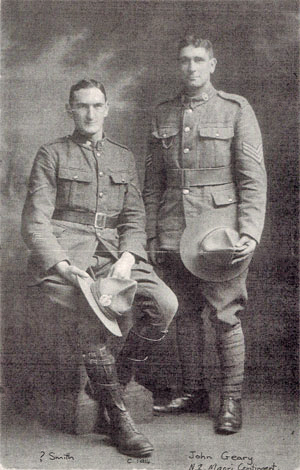 John Geary (left) with a fellow Anzac, probably photographed in Port Chalmers where they embarked for Suez, Egypt on 16 October 1914. Bro. J.D. L.Cpl. John Geary 16/36A, Otago Mounted Rifles (and NZ Māori Contingent). The phrase “gone but not forgotten” could not have rung truer when, on 8 August 2015, a sizable contingent of Freemasons from the Irish, Scottish, English and New Zealand Constitutions, supported by family members, the Fire Service and RSA representatives, paraded in remembrance of Bro. J.D. 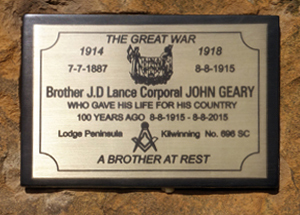 Lance-Corporal John Geary, a Brother who, thousands of miles from his homeland, had given his life for his country exactly 100-years before to the day. At the time of his death, Bro. John ‘Jack’ Geary was the Junior Deacon of Peninsula Kilwinning Lodge No. 696 S.C. at Portobello, Otago. His family had settled on the Otago Peninsula in the 1830’s and were well known in the region. Embarked aboard either the SS Ruapehu or the SS Hawkes Bay, L.Cpl. Geary sailed with his battalion for Suez, Egypt from Port Chalmers on 16th October 1914. Within a few months he was at sea again; his destination - Gallipoli. 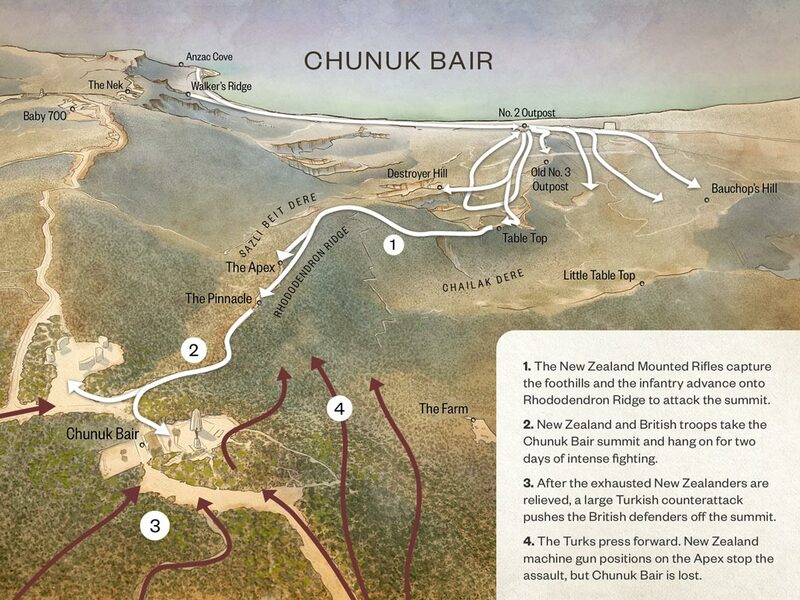 The Battle of Chunuk Bair was one of New Zealand’s epic stands on the Gallipoli peninsula. 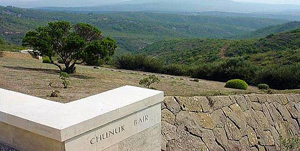 Chunuk Bair was one of the three high points on the Sari Bair range, these peaks being the main objectives of an Australian and New Zealand Army Corps (Anzac) offensive whence they intended to break the stalemate with the Turkish forces in the Anzac sector. In the stifling heat of a Turkish summer in early August 1915, the New Zealand Infantry Brigade advanced up Chailak Dere and Sazli Beit Dere during the night of 6-7 August, attempting to capture the Chunuk Bair heights. Earlier their way had been opened in daring night assaults by units of the New Zealand mounted rifles and the Māori Contingent whose attacks had captured key points (including Old No. 3 Outpost and Table Top) guarding the valleys. The mountainous terrain, however, was brutally rugged and, combined with very strong resistance from the Ottoman forces; this attack had fallen behind schedule. As dawn broke on 7 August, the Kiwi soldiers found themselves still a kilometre short of the summit, and were forced to take what meagre cover there was in a position below Rhododendron Ridge that would become known as ‘The Apex’. Communications between the command post on the beach and the front lines were hopelessly inadequate. 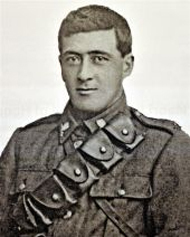 In an almost suicidality brave, nevertheless successful, attempt to rectify this situation, Cyril Bassett*, a Corporal with the NZ Divisional Signal Company, won New Zealand’s only Victoria Cross (VC) of the Gallipoli Campaign, after spending 7th-9th August clambering up and down the steep slopes laying and repairing the field telephone cable while continuously under enemy artillery, machine gun and rifle fire. Cpl. 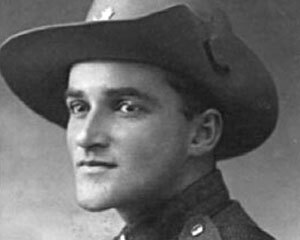 Cyril Bassett was the only New Zealand soldier to win a VC during the Gallipoli Campaign. 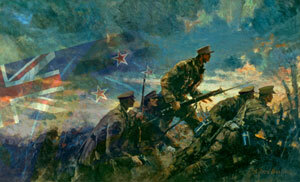 In a mid-morning attack the Auckland Battalion suffered heavy casualties attempting to reach ‘The Pinnacle’, 200 metres from the summit. When ordered to follow suit, the Wellington Battalion’s commander Lieutenant-Colonel William Malone refused to sacrifice his men in a similar futile attempt, insisting that the attack be mounted that night. In the pre-dawn darkness of 8 August the Wellington’s swiftly moved up Rhododendron Ridge on to the summit which, due to heavy shellfire from British and Allied warships off Anzac Cove, had been abandoned by its Turkish defenders. Nevertheless about 100 men were killed clearing Turkish dugouts and machine gun nests on the way. When the sun rose, Malone and his men, assisted by some Auckland mounted riflemen and British troops (the 7th Gloucester and 8th Welsh Pioneers), who also reached the summit, engaged in a desperate struggle to hold off counterattacking Turks. They fired their rifles until they were too hot to hold, then picking up the weapons of fallen comrades, fired those in the same style. 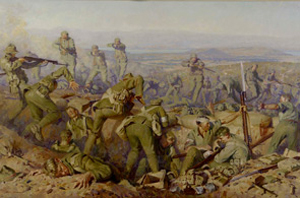 The Battle of Chunuk Bair 8th August 1915 by Major Ion George Brown. During the night of 8-9 August, the Otago Battalion and Wellington Mounted Rifles relieved the Wellington Battalion, only to endure a similar ordeal all through that long summer day. Due to the steepness of the slopes the Turks could advance as close as 20 metres before being seen. This unanticipated concealment caused innumerable vicious one-on-one desperate close quarter, hand-to-hand fights to take place with unyielding viciousness, causing many losses on both sides. They, too, were relieved during the night of 9-10 August by two British battalions, which almost immediately succumbed to a massive counterattack launched by the Ottoman commander, Mustafa Kemal. ** The summit was lost, but the New Zealanders stemmed the Ottoman troops’ flood down the seaward slopes of the hill with sustained fire from ‘The Apex’. The Apex remained in Allied hands until the end of the Dardanelles Campaign. 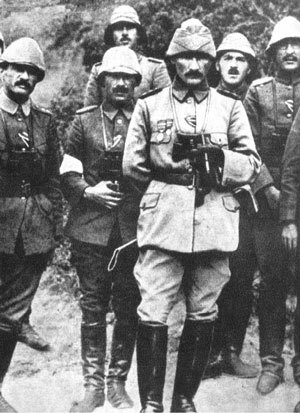 Freemason Mustafa Kemal (Atatürk) was the Ottoman commander at Chunuk Bair. For the wounded the suffering had only just begun. Although the beach area was less than a mile away, rescue and evacuation down the shot and shell ravaged, rugged hills took up to three days. The casualty figures made sombre reading: 140 soldiers from the Otago region alone were killed during the struggle, while of the 760 men of the Wellington Battalion who started up the heights, 711 were killed or wounded. In a cruel turn of luck, at about 5pm on the 10th August, Lieutenant- Colonel Malone and several of his men were killed when shells from two supporting New Zealand howitzers fell short and exploded in their dugouts. Many men should have won a Victoria Cross at the fierce Battle of Chunuk Bair. At the ceremony in Portobello, John Geary’s great-niece Toni Gordon spoke about his background and complex family life - John (or ‘Jack’ as his family called him) having 17 brothers and sisters! Sadly, three of his brothers and cousins; William, Joseph and Percy were yet still to die in conflict before World War One finally ended. On the family’s behalf; the remembrance plaque was unveiled by Orma Blackler, and immediately afterwards the assembled Masons formed into a column to lay sprigs of acacia at the base of the ANZAC Memorial Stone. The Masonic Choir and members of the public sang The Māori Battalion, New Zealand’s proud flag was lowered to half-mast, and bugler Kelven Gaskill played The Last Post in a moving tribute to one of Otago’s fallen sons. And knowing this, I know a soldier’s part. The plaque at Portobello was unveiled 100 years to the day in 1915 on which Bro. John Geary was killed in action. Geary, John – Lance-Corporal 16/36A (and listed as 9/36). Otago Mounted Rifles, main body (drafted as Māori Contingent). Killed in action, 8th August 1915, Chunuk Bair, Gallipoli, Turkey. Enlistment Address: Portobello Camp. This link will take you to an oral history of the battles on Gallipoli. 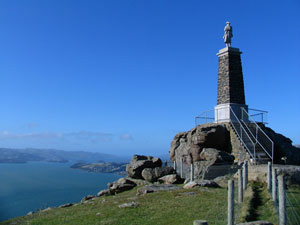 The Otago Peninsula Fallen Soldiers’ Memorial dominates Dunedin’s harbour. **Now better known as Mustafa Kemal Atatürk, Mustafa Kemal was a Freemason and the commander of the Ottoman troops at Chunuk Bair. He was already a seasoned soldier having previously seen action in the Italo-Turkish War in North Africa, and the Balkans Wars. A revolutionary leader, he became the first President of the new nation of Turkey in 1923. (See Famous Freemasons A – L elsewhere on this site. Of the 856 burials at Chunuk Bair cemetery, only 10 are identified. A book, ‘Tangled Threads’ by Celia Geary, well documents the history of the Geary family – HOCKEN LIBRARY, DUNEDIN. *Corporal Cyril Bassett VC miraculously survived The Battle of Chunuk Bair and went on to serve on the Western Front in WW1 where he was twice wounded. He served (against his wishes), on the Home Front during the Second World War, finally retiring with the rank of Lieutenant-Colonel. Cyril Bassett passed away in 1983 at the age of 91. He never spoke of his experiences at Chunuk Bair.